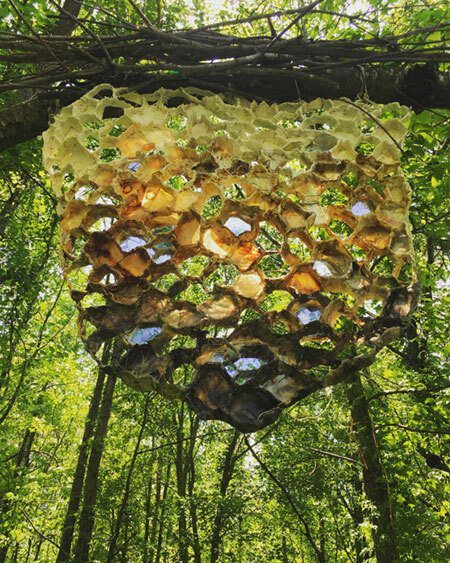 When I was invited by Mary and Howard McCoy, the curators of Artists Dialogue with Nature at Adkins Arboretum, I was honored but also felt a little anxious after what happened last fall to my beehive installation. Do I dare put myself in that position again? But how do I not? Isn’t putting oneself in a vulnerable and exposed position an inherent part of being an artist? 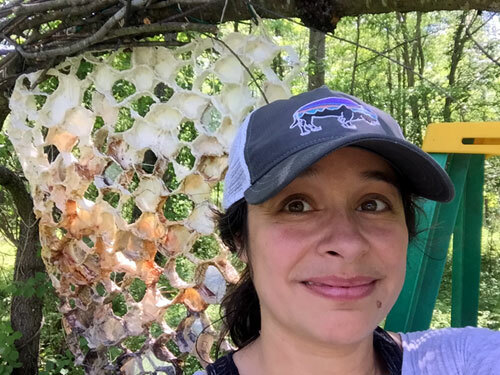 After a few back and forth emails and great advice from these seasoned land artists, I decided that I wanted, no, scratch that, needed to revisit my beehive installation and I was thrilled when they accepted my proposal. I changed things a bit this time around with the ecodying of the fabric that I did and the gradation of the colors. The creation of it went smoother as well since I knew exactly what I was doing…well, things always change in the process of creation- just not as much the second time around. It felt good creating this piece again and I especially felt cathartic when it was done. There will be an artist reception and guided walking tour of the exhibit this Saturday at Adkins Arboretum. 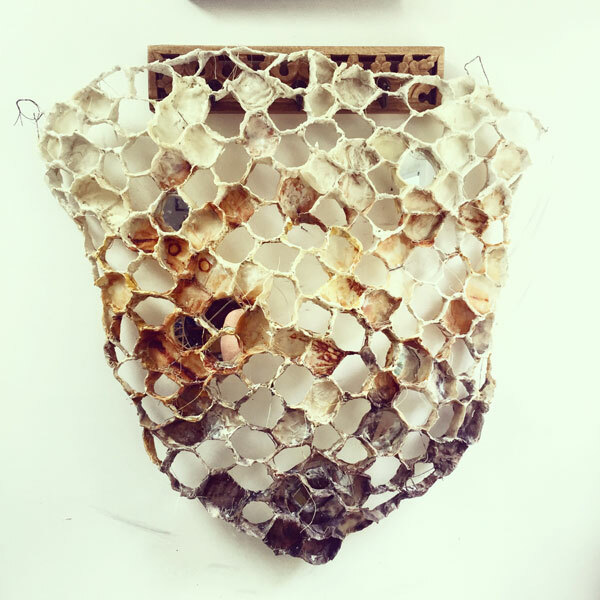 I am so happy that my piece will finally fulfill its purpose of being seen and educating people on how we must help the bees and be stewards of our environment for the greater good of us all. 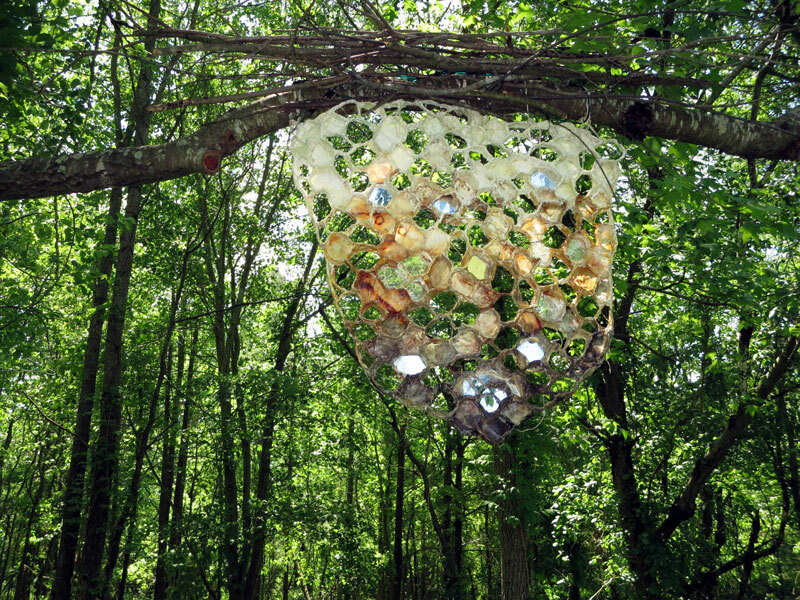 I love how when the piece is in the natural setting, the sunlight and all the greenery around it makes it glow! 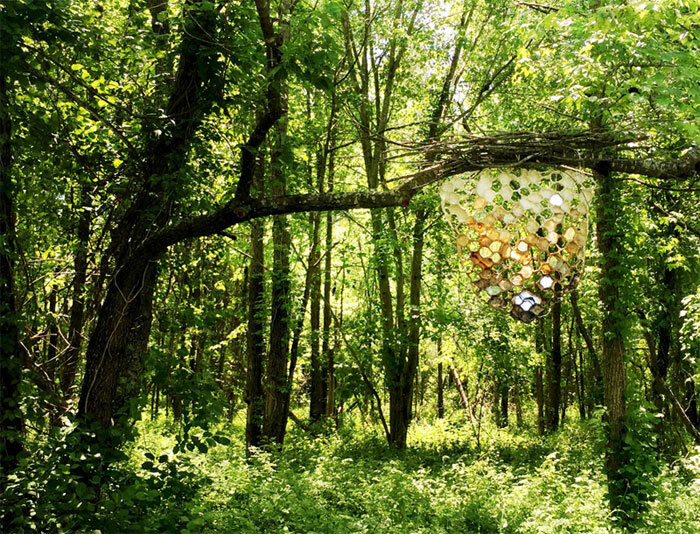 Artist statement: Pollinators are keystone species that entire ecosystems depend on. They provide the fruits and seeds that nourish about 25 percent of all birds and mammals. Colony collapse disorder has been a growing concern as without bees and other pollinators, the food supply for humans and wildlife would plummet as well as the planet’s biodiversity. Scientists are still uncertain whether the colony collapse disorder is due to pesticides, climate change or a combination of both. It is clear though that we need to address the human role in the demise of the bees before it is too late. The mirrors in this piece reflect the viewer back to reinforce the human role in both the demise and in the saving of the bees. “Guardians” can refer to the bees as the one who are guardians of survival of life on this planet as well as humans who need to act as stewards of the bees. Bridgette Guerzon Mills, thank you ever so for you post.Much thanks again.